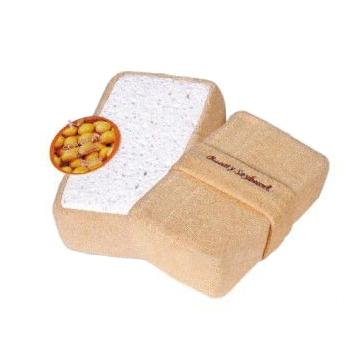 Soya Bean and Loofah Rectangle Bath Scrubber is made with natural soya bean fiber and loofah fiber. Soya bean fiber is extremely comfortable, environmentally friendly, and has been called the "vegetable cashmere" because of its incredibly soft properties. You and your child will be able to experience why it is called vegetable cashmere and enjoy the ultra softness that feels like a second skin. The natural loofah gently scrubs your skin for a clean and refreshed feeling! Loofah is also a great exfoliator that will help remove dead skin cells to leave your skin soft and smooth. Also helps stimulate your circulation. It's the perfect partner for your bath routine. Made with natural Soya Bean fiber and Loofah and internal part made with Polyethylene (PET) (recyclable and has the number "1" as its resin identification code). Loofah also known as luffas. Unlike other sponges over-harvested from the sea or manufactured from non-recyclable materials, the loofah is grown on a vine. It is biodegradable and a renewable resource. Exfoliate dead skin (loofah scrubber).